Celebrities | I ... reach!! When i think of alphabet K for #AtoZ challenge, i cant ignore the mythical character Krishna!! As the profound mythical character who established the sacred Bhagvath Gita which stands the test of time over centuries and provides philosophical guidance to everyone across geographies, culture, religion, caste. For me, it is the naughty child which captivated me by his stories about how much he likes to eat. I always have imagined this mythical character as an adorable child who will win over anyone – may be some of the influence I attribute to the fact that I hail from an orthodox Hindu family background. Nevertheless, I was thrilled that someone actually read it and referred it!! Later i realized, that because of this reference, the blog had booming statistics for a day! So, I am now wondering if i should thank the youthconnectmag or the simple humble real life hero for inspiring me to write this note ? When I found that many are cutting short the three-day conference to two days and getting back home earlier, I was upset .. Upset because I prioritized the third day at the conference over my little one’s annual music day at school. I still could have done a replanning – aversion to last-minute replanning, late nights at airports and to some extent my laziness overtook (I also had an iota of sincerity quotient towards participating in the conference) – I decided to continue on the thrid day. It was still haunting to remember that expectant voice and little face “amma, can you come on Friday morning atleast for the music day?”. I decided I need to give my little one something which will to some extent compensate my absence. It struck me then that I can take something which is unique – an autography from his favorite cricketer Rahul Dravid – it is almost two years since the little one got Dravid’s autograph on a two-inch paper and I was impressed by this cricketer. Rahul exhibited that he is a true hero – read the detail here. I literally grabbed the opportunity when Rahul was waiting at the first row corner to get into the stage – I dashed to him with a notebook and pen and showed this notebook telling in a low voice that it is for my son and his name his karthik – I saw a momentary shock on his face and also probably some irritation (when he is focussing to get to the stage in an official forum, sure he did not expect this!) 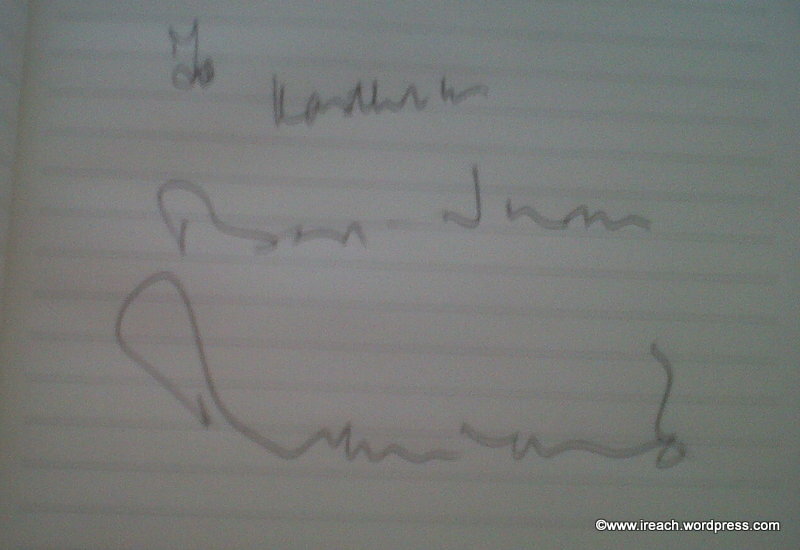 – that was just momentary – he took the pen, wrote my son’s name and gave his autograph. A minute and it was all done – true hero obliging to his fan’s request. My surprise indeed continued when i saw him in the same flight back home – in the economy section, two seats in front of me…again being that same humble, polite, wanting to establish that feeling of “I am one among all of you!” – still accommodating the fans who were asking for an autograph or a picture with him – through the flight, on the ground near the baggage collection area – ofcourse, I was satisfied with the elaborate autograph for the little one which I got in the evening!! Once again, it was witnessing the real hero – is it just being humble OR is it being Rahul Dravid – looks like it is Humble and being Rahul Dravid!! It was a casual review about the fresh face in south Indian cinema – Samanthaprabhu – during that context the latest gossip about her and her co-actor Siddarth came up. A disclaimer here – the intent was not gossiping mindlessly about the cine actors – infact, I am actually at awe about the positive outlook of our Bollywood (tolly/kolly/etc,etc-wood) actors and their perseverance. Many a times, I draw my daily dose of positive energy from their interviews in Bangalore Times (I reserve my thoughts for another article to describe the actors intelligent interviews). Reading their interviews is a refresher – especially after I end up getting uncomfortably desolate reading the front page of any newspaper which off late mostly highlights the terrible side of this worldly life – gender violence, politics, financial scams, major natural calamities, etc…etc…. Overall, he weaves in that fabric which shows him as an intellect that attracts the interest of most of the internet generation – what is impressive is his subtle good marketing sense. It is extremely essential for anyone in showbiz career to be good at self-marketing if they need to succeed and Siddharth does it well – six lakhs followers on twitter is a testimony to his skills. From my perspective – he is one of the smartest kids on the block and to be watched – he makes money and he invests his money intelligently back in the movies- he has the right connections and projects them well – his communication skills are exemplary – the only pitfall he needs to watch is the excessive sarcasm on the happenings around him, especially when it comes to politics – if he could use his celebrity status intelligently and be a catalyst to bring in changes to political system than just being sarcastic – he really zooms up in my assessment! Good luck, Siddarth! Think better and do well and you can be a social catalyst! It was always in the back of my mind – a small throbbing of uncomfortable feeling! From the time when I heard about Nithyasri’s personal incident, I was more concerned on when she will come back – I never had any doubt about her coming back, but was not sure of the period she is going to take to get back with confidence. When I came to know that she was back on music academy with the support of her dear friend musician Sowmya, I had stop my work and google to get more inputs on her comeback. It indeed was so heartening to see her back in her normal avatar.. While we will never know the real reasons of why and what caused this talented woman to face such an incident in her life, I only want to say that it is extremely important for many women to know that Nithya came back to get on with her life and her life’s purpose! Her comeback exhibits the courage of an individual, a woman who wants to put the trauma behind her! 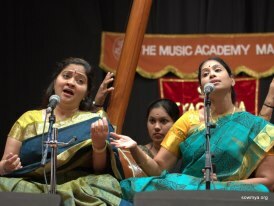 She indeed will be a role model not just for the budding musicians but also for those scores of South Indian Women! WELCOME BACK, NithyaSri – God Bless! ▶ RAJINI SONG Birthday full Version by vijayantony. One of the peppiest (!!) songs in the recent past!! A tribute to Rajni – one of the most popular actor and known for his “down-to-earth” attitude! Have heard this song already many times!! Birthday wishes!! Pranav Mistry – making India proud! Almost few years back, while we were stuck in a traffic jam, the little one was getting restless. Reason – We will miss her favorite TV show. To keep the cool, I was telling her that how nice it will be if we have some technology where we can get to just beam the TV rays on any surface and we can watch TV anywhere. That idea kept the conversation interesting and saved the day. It was long still I forgot about this – and then, one of the days I saw the details of the project by Pranav Mistry – Sixth Sense. You can watch the video here. I was amazed about his innovation and felt that what I discussed with my kid may become a reality sooner than I thought. I was very impressed by this Indian researcher’s innovation quotient. The last 2.5 years, I have been following randomly about Pranav Mistry’s projects. They were very interesting. The latest one was Sparsh which he presented in the Nasscom‘s India Leadership Forum last week. As always, Sparsh was also equally impressive – a technology which conceptually transfer media from one digital device to your body and pass it to the other digital device by simple touch gestures. Watch the video here. I was amazed by this clarity!! Here is one Indian in the new generation who not only is a great technical wiz kid, but the one who thinks of society…………makes us proud. Congratulations and all the best, Pranav!! Yuvraj! – Yes, You can! When I follow cricket as a news and live my life with two ardent cricket fans, it is inevitable I know Yuvraj to some extent – I identify his name with these adjectives – young, energetic, loving son to his parents, raring to make more of life and cricket………… and ofcourse, he is known in the Bollywood circuits also! Knowing as much (actually, as little) as I know about Yuvraj and his family with my as much knowledge about the “big C” disease, I can certainly empathize with what he and his family are going through. While it makes it challenging for anyone to go through the deadly big ‘C’, it is even more challenging to be in the prime of your life and being knocked down by this big C for no fault of his! Especially, knowing how his mother will be feeling now…………….I was really sad. While I completely appreciate the philosophical “Life is just a journey”, this news still left me with an uncomfortable feeling. And today morning, I was looking into Yahoo news and this is the link I got…………….the Cricket Vs Cancer ………made me feel positive and hope that for Yuvraj, the ONLY big C in his life will be the C in Cricket – if all the cricket fans and their family across the world can wish him and support him with their prayers for a minute – there definitely will be a miracle. So, here is the wishing from me and the sincere hopes – “Yuvraj, Yes! You Can!” !! The Big C in your life is ONLY the BIG Cricket! Join me in taking this HOPE statement (Yuvraj, Yes You Can!) across the globe to Boston! Related Posts: Sean Maloney – Inspiring || What is Right? Many a times it happens in the history – a simple photograph unfolds a greater story about the changing world. This is one such picture (thanks to my classmate who shared it with me) – amazing one!! 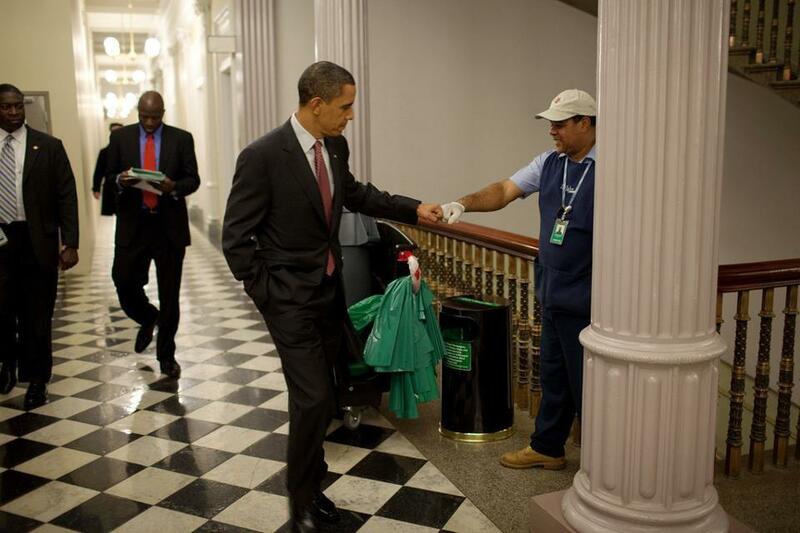 It says more about Obama as a leader – one who appreciates the dignity of labour and respects his fellow human being. The worker looks like a Mexican origin!! It definitely takes some compassion towards fellow human being to recognize our support staff – starting from the maid in our homes till the office support staff. 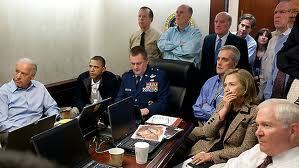 I think this says much about the new age Americas….Well done, Mr.President! You are leading by example! ps – Ok, for those skeptical minds who think this is part of Obama’s political image building exercise considering the impending US elections…..so what? atleast he is projecting this as a good leadership gesture….. You should still remember the other white house picture when the US hunted Bin Laden……. It sure is a big sensational news (read here)!! Aamir khan – super star in Bollywood and his wife Kiran Rao (known for her intellectual brilliance as a director – Dhobi Ghat is a sample) went for IVF and Surrogacy to become parents of a baby boy! While I was reading the news and once again wondering at the advancement of medical sciences (any new-born is a wonder for me and makes be believe in some supernatural power), I could not resist a query which popped up in my mind. Adoption process in India has come a long way. It has moved from a family affair/hush-hush activity to a much more professional process – it is well accepted by the modern Indian society – people who have adopted kids are open about it and they share the details with the kids also – I have couple of my close friends who have adopted kids in India and have shared their experiences with me, which makes me confident that it is now a well-planned process. 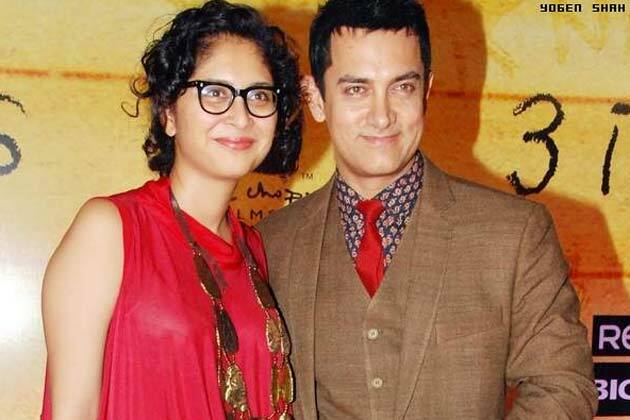 So, what made Aamir and Kiran look for IVF/Surrogacy? I think it is much easier emotionally to accept a biological child (Even if it is through surrogacy) than an adopted kid. A tough topic to mull over!